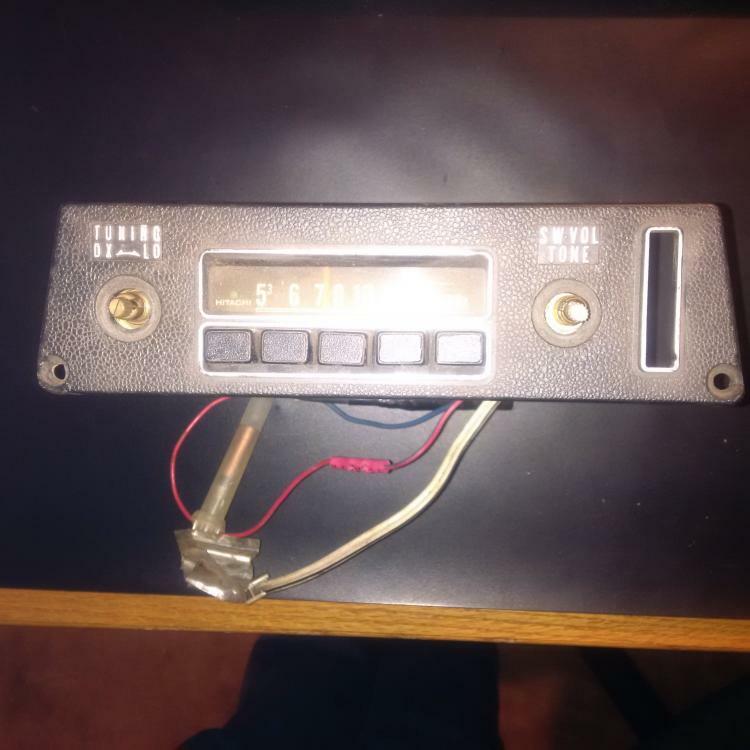 Looking for a original radio. I have no clue where mine is. It it the early AM only or the later AM FM? I don't remember when they changed. Good luck trying to find one at a reasonable price. Both the '72 -'73 AM/FM and the '70 -'71 AM Hitachi factory radios values have gone through the roof. 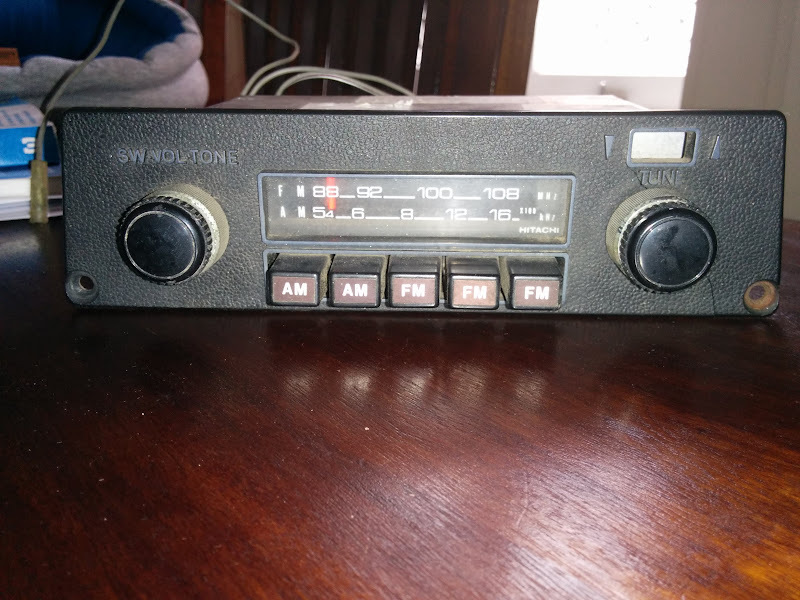 Just a few years ago you could buy an AM/FM radio on eBay in good condition for $125.00 to $150.00 and an AM in good condition for $250.00 to $275.00. Now, you rarely even see an AM on eBay except for the seller on eBay who restores them to like-new condition that are listed for over $1,000.00. The AM/FM radios in average condition are now going for over $400.00. 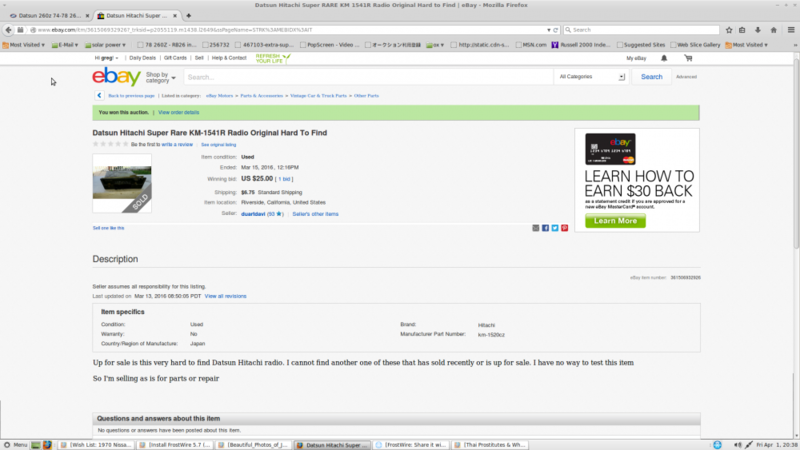 There are exceptional deals on radio's that can be had if you look. I got this one for $25 on ebay. Not sure if it works yet. Just unpackaged it a few days ago. Edit: just noticed the seller has the wrong number. He actually sent a KM-1520ZD but it has the wrong faceplate on it LOL. Great find, HR369! As you know, the KM-1520ZD is the '72-'73 240Z AM/FM radio. All you need now is the correct faceplate. Gents, on the subject of radios (apologies if I am hijacking this thread) - I have a Hitachi radio in my parts stash with the model number TM-1081ZB(S). Any thoughts on what this represents ? I found out that the model number TM-1081ZB(S) represents the A.M. radio for a 1970 - 1971 240Z. Hank, Nice find in your stash of parts! Here's a link that provides some info on your AM radio. Do you plan to keep the radio for one of your '71 240Zs or sell it? Steve, thanks very much for the link. That's the radio I have but it appears to be missing the power antennae switch. My yellow stock Z already has the original a.m. radio (did not remove it from the car during the resto so I didn't know the serial number), and in the silver restomod, I have an original AM/FM radio from a 1972. I'm not yet sure what I'll do with the radio - have to put a think on it. That is an awesome find!!! Wish I could find a TM-1081ZB(S) for my restoration. Hank I'm looking for a TM-1081ZB(S). 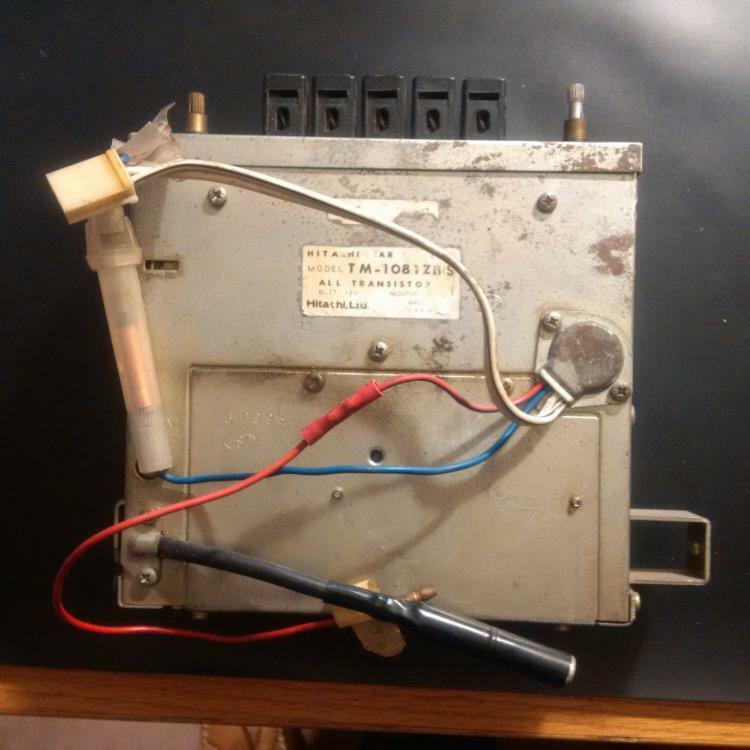 I have a later 72 model radio (missing switch for antenna) I'm willing to trade also! Gav - I thought you require a TM-1081ZA and already have a couple of TM-1081ZB radios ? Or am I confused (my typical state of mind) . As far as we can tell the difference between the 2 is Red light for the 'A' and Green for the 'B'. You are correct I already have 2, but chasing a third unit if I can find 1. I don't mind if it is A or B. 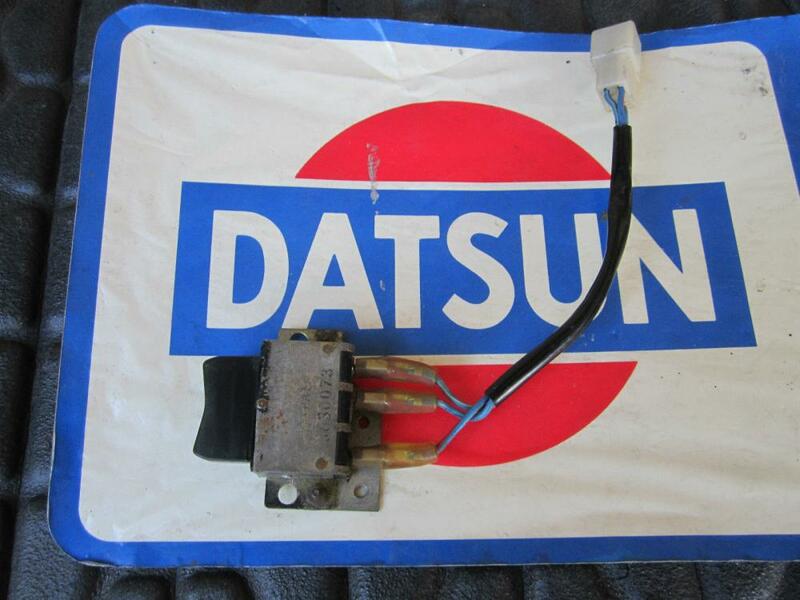 Missing antenna switch or faceplate, will basically take what I can get. Gav - I think I'll hang on to the radio for now but if I decide to get rid of it, I'll get in touch. Thanks, I may have found 1 so fingers crossed. But let me know if you do change your mind. As I haven't fully tested all mine and hopefully they can be repaired if needed. Hi Gang... So glad I still have mine! guess I'm a lucky dog! Just think how many of these were trashed for "upgrades" Crazy! Speaking of the original z radios I'm looking for the manual that came with the car. I have all the other original documents for my car, maintanance log, plastic card for dealer with vin and other information specific to the car... Folder it tucks into, original window sticker ( cool find) Etc... The car is very well documented. 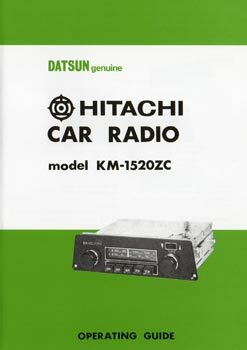 But I realized that most Z's also came with a manual for the hitachi radio, and since mine is still installed and in great working order, Id like to add this to complete my manuals. Reproductions can be found at the z store, but I'd like an original, if possible... (Can you say purest! Lol!) Also some Z's came with a manual that just had in large print AM/FM... I've only seen this in one car, but I'm curious, and would like either or both. If you stumble across either one, have a source for either, or don't have a need for yours, since you no longer have the radio, please contact me! Yes I am looking for an original, but this website had some other great stuff! Thanks for the response!